Want to be notified of new releases in fboender/sla? Tired of Make's moronic syntax and rules? Not working on a project that requires incremental compilation? 😭 when you need to install 2.4 GiB of Ruby dependencies for a simple build system? Want to be able to execute simple build rules from anywhere in your project tree? Then sla is for you! sla is the Simple Little Automator. It's a tiny shell script that invokes shell functions found in a build.sla script in your project's root dir. It is ideal for smaller projects and projects that don't require compilation, such as scripting languages. Every task running / build system I've researched is either for a specific language, too large or complicated or uses declarative style build rules. Declarative rules are very limited in their capabilities. It's often not even possible, or very awkward, to do loops, which immediately leads to the creation of helper shell scripts. The build tool then becomes nothing more than a wrapper around those scripts. So why not use shell scripts right away? That's what Sla does. It's not limited to a single language. Most projects don't just need to compile code. They also need to setup projects, run tests, generate documentation, etc. Interpreted languages don't require incremental builds at all, making most build systems' core functionality useless. It's cross-platform, so it will run everywhere. It's powerful. You can script basically anything. You don't even need Sla installed. You can run build rules directly through the shell. Sla is just a simple convenient wrapper. It's easy to call other build systems such as Make through sla, so we don't lose any functionality such as incremental builds. It allows you to list the available rules, something Make still can't do properly after 43 years. You can run target rules from anywhere in your project. Sla automatically times your builds. #   $ bash -c ". 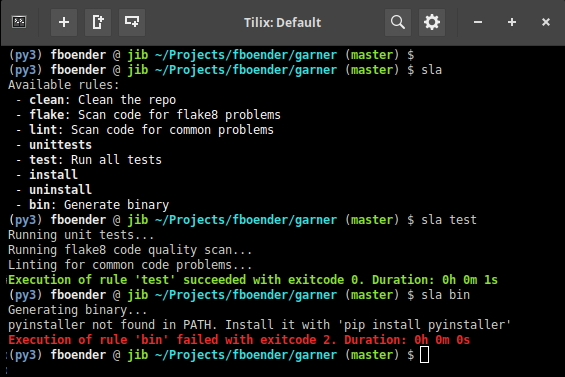 build.sla && test"
As you can see, build rules are just plain old shell functions. Creating dependencies on other rules is as simple as calling it as a normal shell function. Functions that start with an underscore ('_') are not shown. If a comment is present right after the function definition, it will be used as a description for the rule. Only one line is supported. ~/Projects/my_project $ bash -c ". build.sla && test"
That's useful so that people don't need to install the build system you prefer just to do a make install. Simple Little Automator. Find and execute tasks from a shell script. You can use the --verbose option to show what your rules are executing. Basically the same as doing set -x in your script. # Your cleaning instructions here. The doc rule converts a Markdown file to a manual page. entr watches all changes to *.1.md files in the project, and if any of them change, it executes sla doc to regenerate all man pages. env install -m 755 ./sla "$DEST"
You can install sla with itself from the repo. For the above to work, you should have ~/.local/bin in your PATH. For the full license, see the LICENSE file.